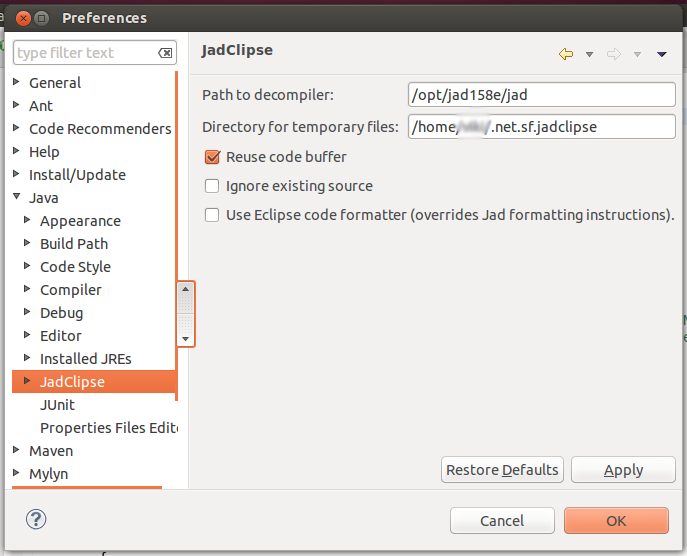 How to setup Jad and Jadclipse for Eclipse on a Linux machine. Personally i have had problems with this setup many times in the past So i have put together this guidelines to do the setup in a hassle free manner. Though this guidelines have been tested only on Ubuntu 13.04 and 12.04. They should work on generally any Linux machine. Now i am assuming you have eclipse Installed. If not please install that first. 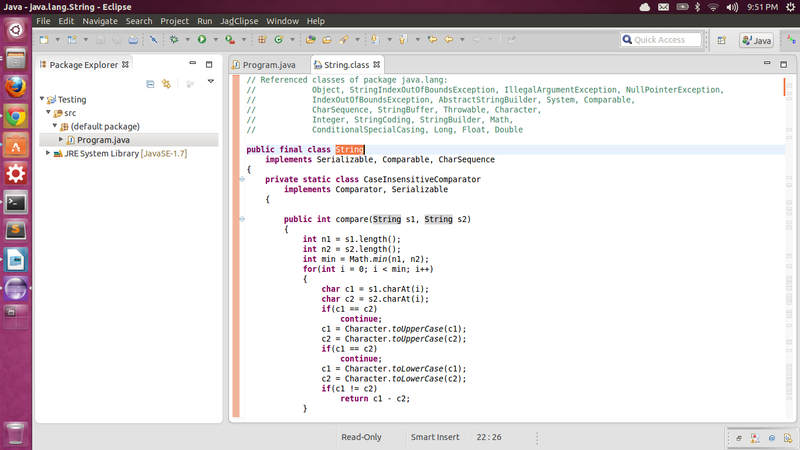 Download jad from this location JAD Java Decompiler Download Mirror and extract the file. Jad 1.5.8e for Linux (statically linked) So i downloaded this one. Arrange for any .class file. It ok to either make one by yourself. Or copy any eclipse path/plugins/*.jar file and extract it and you will find many .class there. A .jad file should have gotten created as classFileName.jad. copy it to you eclipse/plugins directory. Ensure that you have selected the "*.class without sources" in the upper box. This is where i make mistake most of the time. 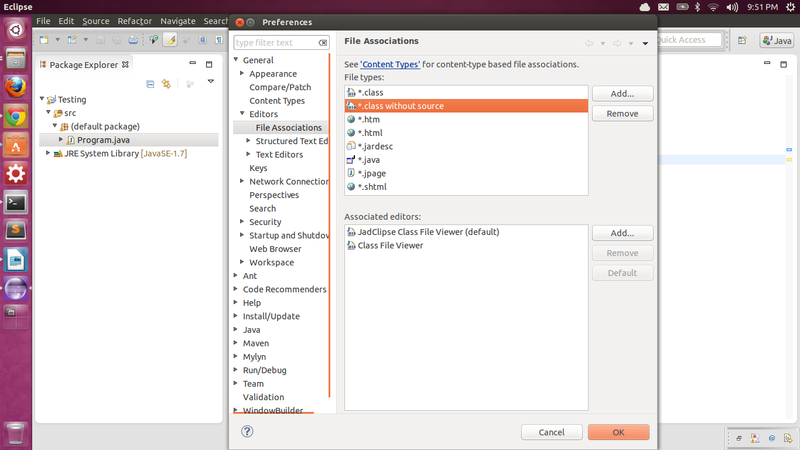 Select class without source on the top box Select "jadClipse Class File Viewer". Set it as "default" viewer for class files without sources. This is also very important step. Now close this window and open any java library file. De-compiler should be working fine now. Please leave comment, any Question below. I Will be happy to answer. Note: There could be steps for installing jadClipse plugin also, as its not always the case that it would be installed. However, I did google. This is great post. Thank you so much! Do you have gc++ installed. If not please try installing that. I am getting the same problem as Ganesh. I installed gc++ as you suggested, but still the problem is not solved. Please help. I have completed this in less time, since I found this page. Its great help to me. Thanks Vikash. I had to give write permission to the directory where ".net.sf.jadclipse" directory has to be created. After that, it worked like a charm. Thanks dude! Awesome Vikash. It worked in first go on Ubuntu 14.04. Thanks! Hi Ravi, Try to change permission by using the following command. If this you have done and its not working then please reply with the output of the following command.